One glorious summer’s day in 2012, I visited Abereiddy for the first time and indeed, I was impressed. The bay although quite small is so engaging and with wonderful walks over the clifftop, the area is simply spectacular. 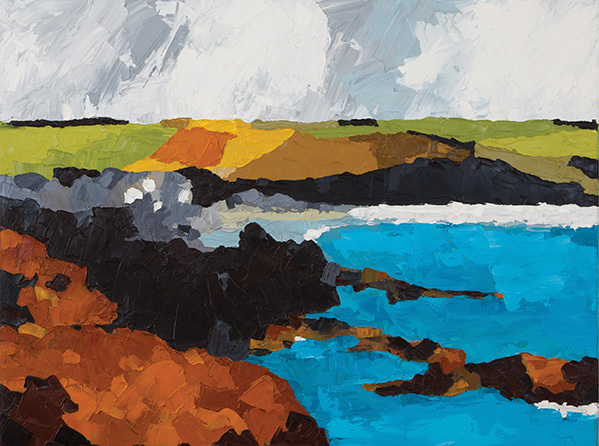 This is a painting reflecting strong contrasting colours and an endearing seascape set against the ‘fields of gold’ which reflects Wales’ landscape at its best. The use of a bold colour palette sets the overall theme and no attempt was made to diminish the vividness of the painting at any given time during the process.